If you want to add a spouse or someone to be able to see the team, and well as receive messages sent to your player, do so from the mobile app. The recipient will receive an email to confirm. They will need to create an Sports Engine account. NOTE: Only the primary account holder (typically the parent who registered the player) will be able to see the team's private information and roster, receive emails regarding payments, invoices, and player privacy account info changes. The other parent/guardian will be invited to go to http://www.moysc.org and Create an Account to become a member of Manchaca Optimist Baseball/Softball on SportsEngine. If they don't already have an account, when you invite them with the steps below, they will be asked to create on. On the top left of the page, click to 'Login' or 'Create an Account'. This is your SportsEngine account. After logging in, select to join our organization or join the site to start receiving communications sent from MOYSC. Your Sports Engine account has a dashboard where you can see, configure and manage your player profiles and invite other users to your household. Go to http://www.moysc.org and login. Click on the down arrow by your username on the top left and in the dropdown, choose Account Settings. Then select Profiles to manage your player profiles. If you can't create an account with an email address because it says the email address is already in use, then that email is probably linked as a 'secondary email' under another account, like a spouse or family member. If so, that other user must remove your email address from their account completely before you can use that email to create an account. Download the SportsEngine mobile app for your smartphone. Find the links below on this page. Open the app and login with your SportsEngine account. Teams will automatically appear in the mobile app for users that were responsible for completing the registration for their player. For other users, you must be added as a guardian to the player profile by the parent that registered the player. See that topic on this page. Click on the star to put the team in your favorites list. You can access all of your team functionality within the team's home screen. If you can't find your team ask your coach to message the webmaster to help. 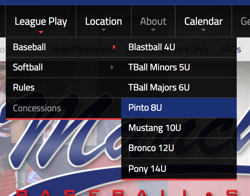 Under the 'League Play' menu option at the top of the page, mouse over baseball or softball, then select the age division (TBall, Pinto, etc). On the next page, you should see the schedule of events and games. Click to view your team. Privacy: Individual Team Pages are private and only accessible by parents/players/coaches registered to that team. Navigate to your profile dashboard. See instructions on this FAQ page for how to get there. Select the player profile with which to add someone. Click ADD. You'll be prompted to put in the email address of the other parent/guardian. They will now receive all team emails and texts. If you have more than one player in your household, you must link the additional account on every player's profile account page. Repeat the steps above. The other parent/guardian must go to http://www.moysc.org and Create an Account to become a member of Manchaca Optimist Baseball/Softball on SportsEngine. If they don't already have an account, when you invite them, they will be asked to create on. From the SportsEngine mobile app, choose your team under the Favorites icon. Choose Schedule icon in lower left. Choose Upload (up arrow) icon in upper right. The next window allows you to select the calendar that you want your SportsEngine team schedule to go into to. Navigate to the team page. Click the 'View All' link at the bottom of the game listing. Find and click on the 'iCal' or 'Subscribe to iCal Feed'. Go to your favorite calendar application. Add the feed based on instructions for that application. If you have other players on different teams, you can can do this for each of the team schedules so everything is in one place. This is useful for families with multiple players. When your Team Manager or Coach creates a new game or event and invites you, you will be notified of the event (through email, the website inbox, and text notification based on your preferences) for which you need to RSVP. You can RSVP from any of these locations. All email addresses associated with the roster player will be sent the invitation/RSVP email. NOTE: If recurring event, you can click on Going to RSVP for all dates and then click on Schedule to make any RSVP changes to individual recurring event dates. Is your coach or team manager sending emails and texts, but you're only getting the emails? It's easy to update your notification settings on SportsEngine. Login to your SportsEngine account on the http://www.moysc.org. Next to your username in the top left, click the down arrow to pull down the menu. Click on 'Account Settings' to open your account management dashboard. In your dashboard, choose Settings and Profiles. From here, you can update your account info as well as email addresses. To receive both text and email notification, check the Email and Text boxes under Notification Settings. If the Text box is left unchecked, you will not receive texts. Receiving Too Many Messages From Your Coach? If you are receiving too many messages, you can adjust your settings following the steps in 'CONFIGURE TEXT AND EMAIL NOTIFICATIONS'. You also might be the 'secondary email' under another user's profile. That user can remove you under their dashboard and add your email as a linked account. You will then be able to configure your notification settings for text and email under your account.